Time pressures? What time pressures? | More blue fabric? Time pressures? What time pressures? New Year’s Eve is a strange thing; for some people there’s nothing they like more than staying out into the wee small hours, giddy and drunk on the promise of a new year, whilst for others they couldn’t care less and are happily tucked up in bed like on most other nights of the year. I am not one of the latter people. And as one of those who like a good party on NYE, I also like to have a fancy dress to wear. 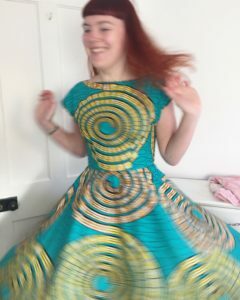 This year (16 into 17) I was thinking about my dress for months. Not on purpose. It was more that I had a vision in my head of the perfect dress that I wanted to make but no opportunity to wear it. 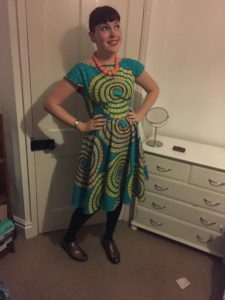 A leopard print wiggle dress. Outrageous but, for NYE, just outrageous enough. 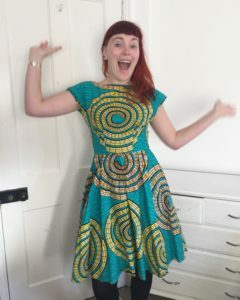 I found a pattern, I found some amazing leopard print scuba in Dalston, I was away. And then, at 4:30pm on New Year’s Eve I actually tried on the dress (I’d not had a chance to before then because of various Christmas crafting projects and Christmas being social projects). It was a disaster. Not unsalvageable. But certainly not something that could be sorted before heading out to a party. I had less than two and a half hours before we headed out, and I needed to eat in that time. It would have been madness to try and make something new in that time, right? 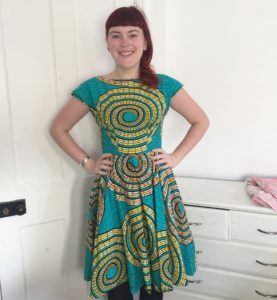 A slash neck dress with a three quarter circle skirt. No, but it is a turquoisey green which can sometimes count…. 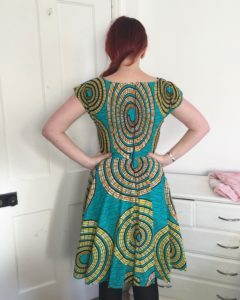 A gorgeous African wax print that I bought from the rag market during Sew Brum. Erm, getting it done in two hours (allowing for the break for dinner)? I cut the fabric out not really sure if I would actually manage to get it done in time, so getting it all sorted felt pretty good. Plus, in amongst the mild mania of the creation, I managed to get a neat pattern match on the bodice back and I’m really pleased with the pattern placement of the yellow spiral on the bodice. Would you look at the pattern placement on that…. 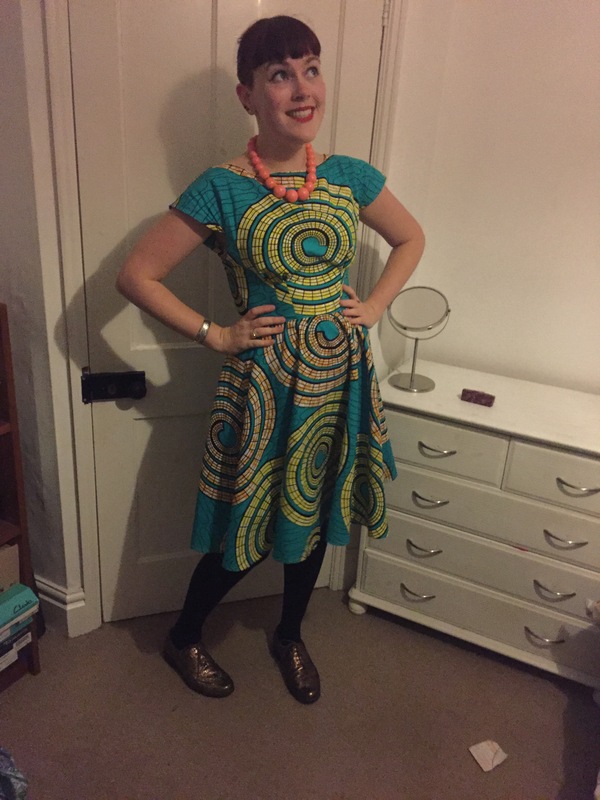 I did feel pretty rude when our friends turned up for pre-drinks and I went “can’t talk, got to hem!”. They all went and played some weird game about Vikings (so weird, a half hour of googling can’t find it…) with the boy instead. To be honest, based on the sounds of confusion they were making, I’m not sure who got the worst deal there…. I would. 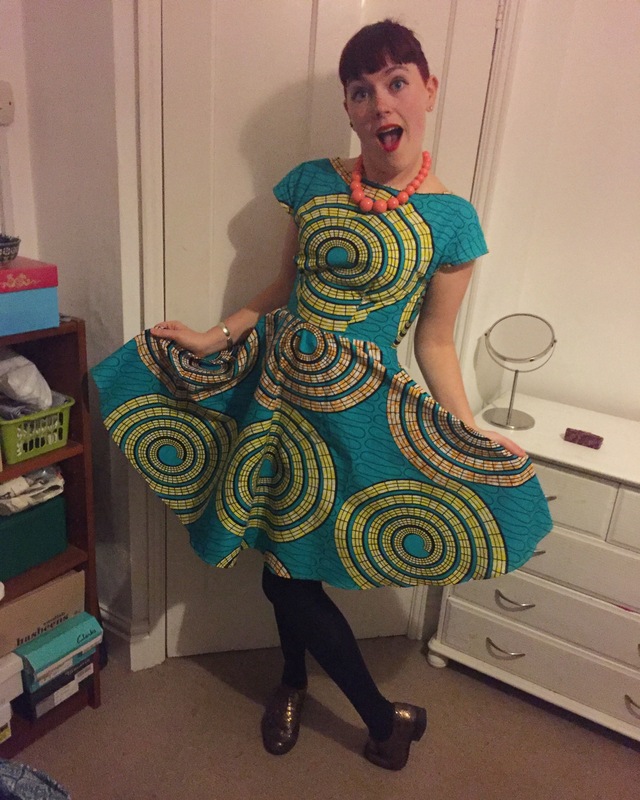 I’m smitten with this dress and have worn it a couple of times already in the last month. It swooshes ever so nicely and is dressy without feeling over the top. Although next time, I might try to take my time with it.